In December, I went to the island of Kauai in Hawaii. It is difficult to explain with words how beautiful it is. The colors just entranced me as Kauai seems like God's great photoshopped color altering experiment. You just can't believe it even when it is right in front of you. I found myself trying so desperately to memorize every beautiful detail in my mind. It felt a bit like when I stood under the ceiling of the Sistine Chapel, (except there weren't monks shushing me and my neck didn't hurt). 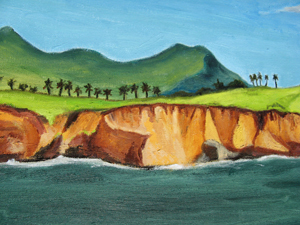 In the end, this painting is a result of the hundreds of photos that I took as I hiked with my husband along Kauai's lithified sandstone cliffs. As always, the still small voice whispered "Paint this!" as I stared at these beautiful rocks meeting the ocean , their complementary colors screaming to be noticed and recorded as they cried out "beauty does exist!" I hope that my painting shares their sentiment.